Bengaluru: Wipro Ltd on Friday reported first-quarter earnings that beat analysts expectations, as net profit rose 11% to $307.55 million from $277 million in the preceding three months, primarily on account of gains made from divestment of one of its businesses. India’s third biggest software services exporter guided for revenue to grow at best 2.3% in the current quarter, leading some analysts to believe that while Wipro’s sequential growth is improving, it is still far from turning the corner. 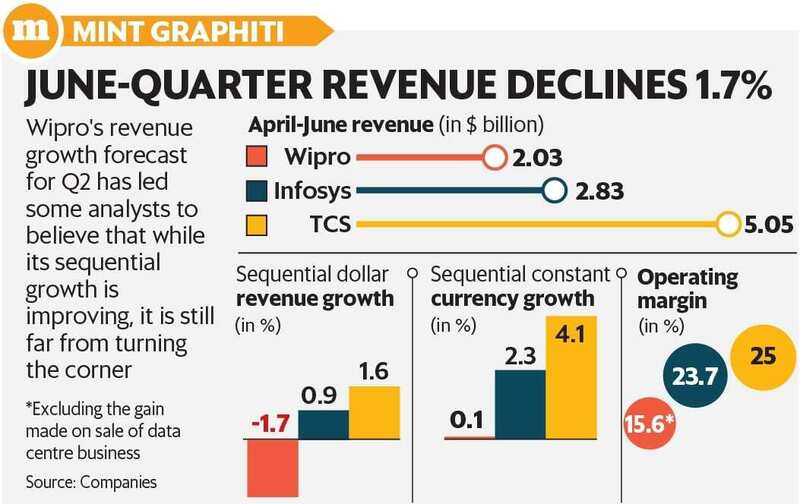 Bengaluru-based Wipro’s dollar revenue declined 1.7% (improved 0.1% in constant currency terms) to $2.03 billion in the quarter ended 30 June from the preceding three months, after it had earlier outlined quarterly growth of at best 0.2% in constant currency terms. Wipro, which gives only quarterly growth outlook, expects to grow its revenue between 0.3% and 2.3% in constant currency terms in the July-September period from the preceding quarter. A Bloomberg survey of 21 analysts had forecast Wipro to report revenue of $2.04 billion, or ₹ 13,983.1 crore, in the quarter. The analysts estimated the company to report a net profit of $287.75 million, or ₹ 1,968.5 crore, in the period. “I’m happy with our performance in this quarter," Wipro chief executive officer Abidali Neemuchwala told Mint. “Remember, we had said in the fourth quarter that our revenue could de-grow by 2% and would be at best flat. So based on the excellent execution by our team, we have managed to start on a fairly good note." Wipro’s revenue from clients in the banking and financial services industry, which accounts for 30% of its overall revenue, improved 3% sequentially in constant currency terms. US and Latin America, which bring about 55% of company’s business, grew 2.9%. Still, Wipro’s performance in the first quarter pales before that of its larger rival Tata Consultancy Services Ltd (TCS), which declared a strong first quarter earnings, reporting a 4.1% sequential constant currency growth at 25% operating margins. “Q1 beat and in-line Q2 guidance should assuage investor concerns. QoQ growth trajectory should improve for the rest of FY19, though YoY trends will remain subdued," Diviya Nagarajan, an analyst at UBS Securities, wrote in a note after the company declared its results. Wipro managed a 2.9% growth in constant-currency terms in 2017-18, while TCS reported a 6.7% growth and Infosys managed a 5.8% expansion in constant-currency terms—lower than industry association Nasscom’s 7.8% growth estimate for the country’s $167 billion information technology outsourcing industry in 2017-18. Infosys expects revenue to grow 6-8% in constant currency terms in this current financial year while at TCS, which does not give quarterly or yearly forecasts, the management has said it expects to clock double digit growth in the current financial year. Wipro’s operating margin was 17.2% for the June quarter compared to 14.4% in the March quarter. This higher profitability was on account of gains made by Wipro selling its data centre business. Outside of this gain, the operating margin was 15.6%. “I feel very good with the kind of progress we have made as I have repeatedly said in the past that we are making the company future-ready by investing in digital and making acquisitions. The only areas that are still an issue are the restructuring business in India and Middle East and our business of Health Plan Services," said Neemuchwala.